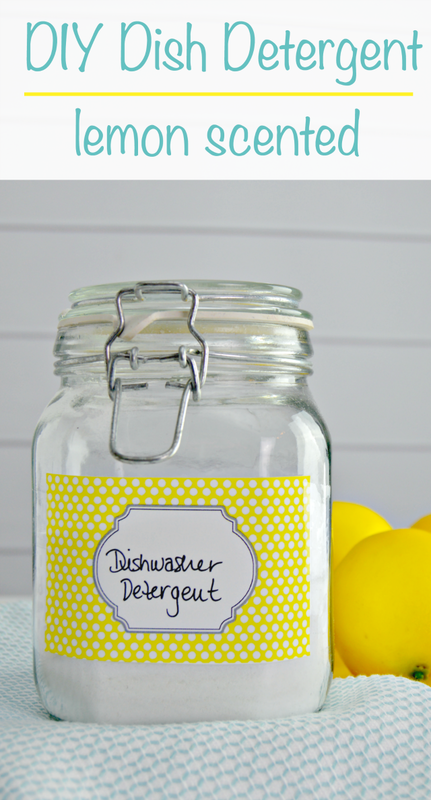 This Lemon Scented DIY Dishwasher Detergent is simple to make and will leave your dishes super clean and spot free! 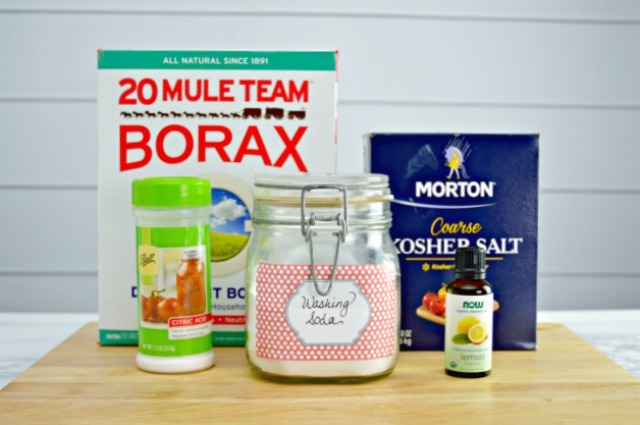 I’ve shared a recipe for 3 Ingredient Dish Tablets and an easy DIY Dish Liquid, and now I wanted to share an alternative…Lemon Scented Dishwasher Detergent in a powder form. You just add a scoop to your dishwasher detergent compartment along with 3 drops of dish liquid and it will leave your dishes sparkling clean and spot free too! This post contains affiliate links, which means that if you purchase products via any of these links, I will receive a small commission. 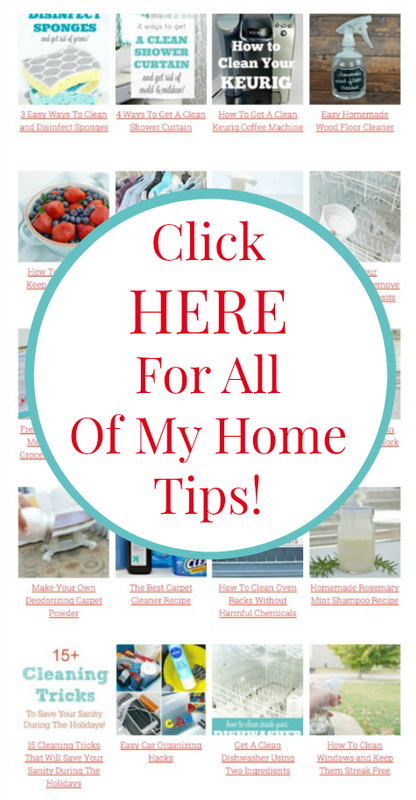 Most of these items can be found at your local grocery store or at health food stores. I am providing the Amazon links in case you’d like to purchase them online. 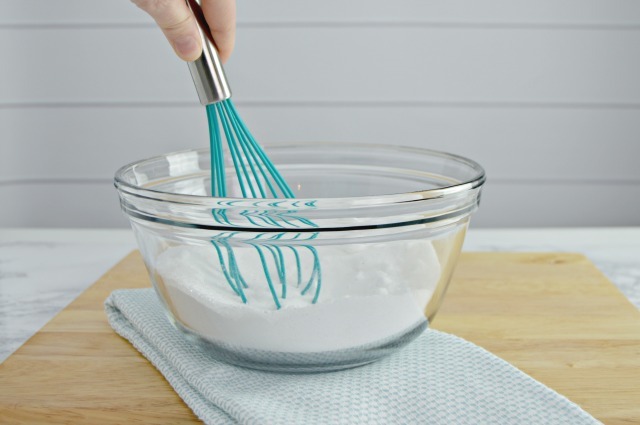 Start by adding all of the dry ingredients to a large bowl and mix well using a kitchen whisk or spoon. 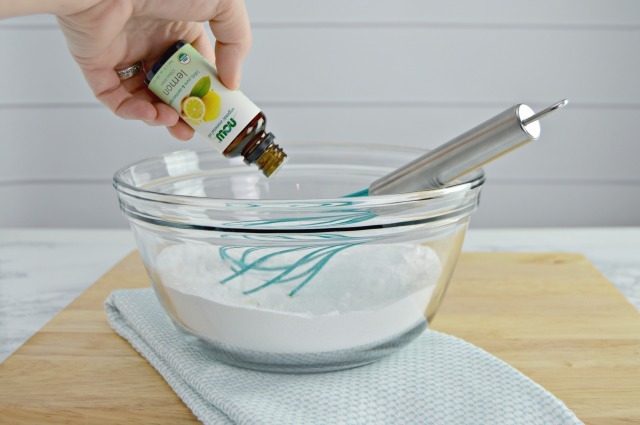 Next, add 15 drops of Lemon Essential Oil. You can substitute orange essential oil if you like. The citrus oil is necessary though to help remove any stuck on residue and make your dishes smell citrusy! Whisk very well, making sure to distribute the lemon oil well. You will be able to tell it’s blended when you can’t see any lumps. 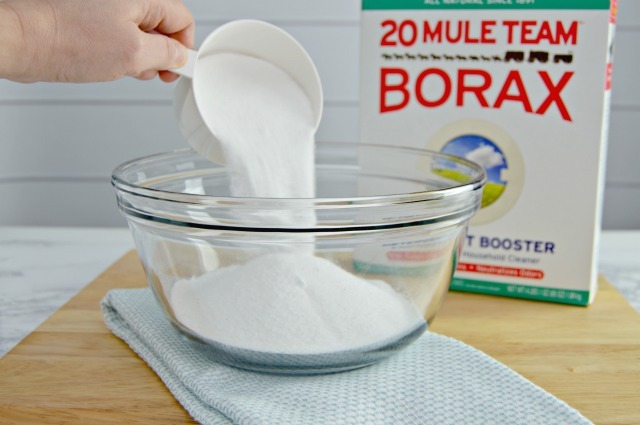 To use, add 1/8 cup of the detergent or 2 tablespoons to your dishwasher detergent compartment. To make your dishes shine and make sure they are spot free, add 2-3 drops of dish liquid to the mixture once it’s in the dishwasher detergent compartment. Be careful not to add too much so it won’t suds up. 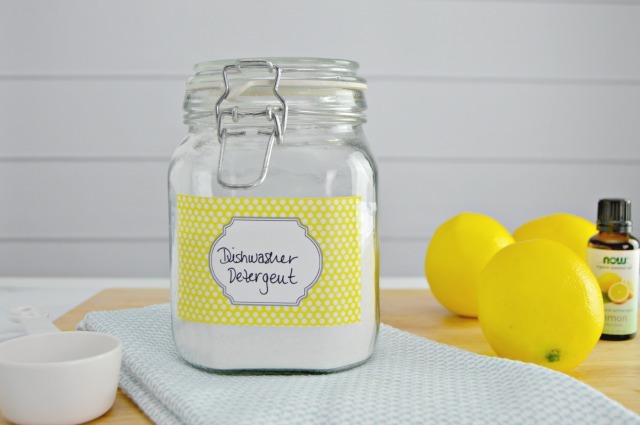 Your dishes will come out clean, spot free and smelling lemony fresh! Does this recipe work for well water? Some soaps seem to need more rinsing to remove all the soap residue. It’s tricky to get the ratio right, to much soap leaves soap behind. Not enough soap leaves dirt behind.